The American Community Survey (ACS) is an ongoing survey by the U.S. Census Bureau that provides vital information on a yearly basis about our nation and its people. Through the ACS, we know more about jobs and occupations, educational attainment, veterans, whether people own or rent their home, and other topics. Public officials, planners, and entrepreneurs use this information to assess the past and plan the future. Check out this interactive map or visit the Census Bureau's ACS page for more information. Visit our 2020 Census page for information about the Census and why it is important to you! Brief reports containing graphs and tables for each county for the following data items: Population, Per Capita Income, Labor Force, and Employment by Select Industry. Please take a moment to participate in a survey to help us improve this site. If you are just starting your search, please minimize this window and revisit the survey when your search for data is complete. 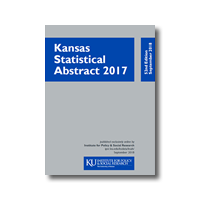 Static data tables, in Excel and PDF formats, are available in the Kansas Statistical Abstract Enhanced Online Edition. The Kansas Regional Data Portal was developed in collaboration with the Kansas Association of Regional Development Organizations (KARDO) for easier access to key indicators for Kansas regions. Easier access to data gives regions more time to analyze the strengths and opportunities of the region and develop data-driven goals and objectives. Interactive graph allows selection of year and county. Note: Male population expressed as a negative for graphing purposes only. 2009 Estimated Population by Single Year of Age by Gender. Includes animated population pyramids 2000-2009. 2000 Single Year of Age by Gender Tables and Pyramids. Includes animated population pyramids using 1980, 1990, and 2000 Census data. 1999 Estimated Population by Single Year of Age by Gender. Includes animated population pyramids 1990-1999. 1990 Tables and Pyramids are also available. Reports containing population and housing figures on state, county, and city levels. The Examples of Connecting SAS to WWW have been moved to a new page. The most comprehensive visualization of U.S. public data. Data available for states, counties, metro areas, places, and PUMAs. The National Historical Geographic Information System (NHGIS) provides population, housing, agricultural, and economic data, along with GIS-compatible boundary files, for geographic units in the United States from 1790 to the present. This data is searchable by county and then by 2-6 digit level NAICS codes. Census data and maps available on national, state, county, city, tract, block group, and block levels. Census microdata for social and economic research hosted by the University of Minnesota. Web application offers population, housing, labor, BLS Employment and Wages, and BEA Employment and Earnings, with the capability of comparing any two U.S. Counties. Missouri provides numerous web applications for users to easily view/download Census data.